It has been an exceptionally long time since my last post on the garden blog. It appears the last one was around June of 2012! Well, last year was a disaster. We had a really extreme summer with a major heatwave – and little to no rain. In addition, it was the birth of our daughter back in April as well – so I was absolutely bombared with other things that needed more attention. So mid year last year, I stopped posting. Hopefully this year I’ll be able to do some kind of normal postings. But, if this year has just as bad weather wise, the blog will probably have just a few posts like last year. Let’s start off with some pictures. Time time last year, it was 80 degrees already. Today, it was SNOWING out. We got the largest snowstorm of the season – and it is Spring! What happened? We had two other snow events earlier in the season – but now we just got about 8 or more inches of snow today! It took me over 1.5 hours to use the snow blower to clear it. I tried to get out there and get through it – but it was wet, heavy snow. Not fun. To make matters worse, I got the back driveway done (pictured below) and then I lost a swivel nut for the handle for the snow blower. So I had to take the swivel nut from the thower so I could at least finish the driveway. Amazing – one year and what a difference. From 80 degrees – to about 30 degrees this year. I’m hopeful that maybe this means this summer won’t be nearly as warm. It has been unseasonable cold for the past week or so here according to the weather folks. Last year it was unseasonably warmer. Downstairs, the ‘germination station’ is going well. The Ventura celery was started around the beginning of the year along with the Varsity onions. At the beginning of March, several other items were seeded. Six Snow Crown Cauliflower, five Green Goliath Broccoli, five Premium Crop Broccoli, and a lot of California Wonder Peppers. All of the cauliflower and all of the broccoli sprouted. Amazing. The seed is at least two or more years old now. Tomatoes were also planted at the beginning of March as well. Five Red Cherry tomatoes, about six Roma Tomatoes, and around nine Best Boy. Not ONE of the Roma tomatoes sprouted. Two of the Red Cherry tomatoes sprouted. And, almost all of the Best Boy tomatoes sprouted. So I had to transplant some of the Best Boy tomatoes into their own containers. I planted three seeds of each in a square container. And lastly is the lettuce. Last year, I had great success with Simpson Elite, Red Salad Bowl, and New Red Fire lettuce. We had POUNDS of lettuce and we had to give a lot away. the first planting was also done around March 1st with a second planting just last weekend. they are coming along well – and there are 12 plants now. That is all for this post. Maybe the weather will start to get warmer – but they are saying 40’s this coming week. Just thinking… last year I was planting peas and potatoes. Today, we get a heavy snow storm – and I just bought the Kennebec seed potatoes today at Rural King for 35 cents a pound. What a difference a year makes. Ever get a spam message from a company called GoNext Solutions trying to offer you Search Engine Optmization (SEO) services? Well, beware. There are many posts online that give golden reviews to this GoNext Solutions company. But I have to warn you – they are all absolutely false. 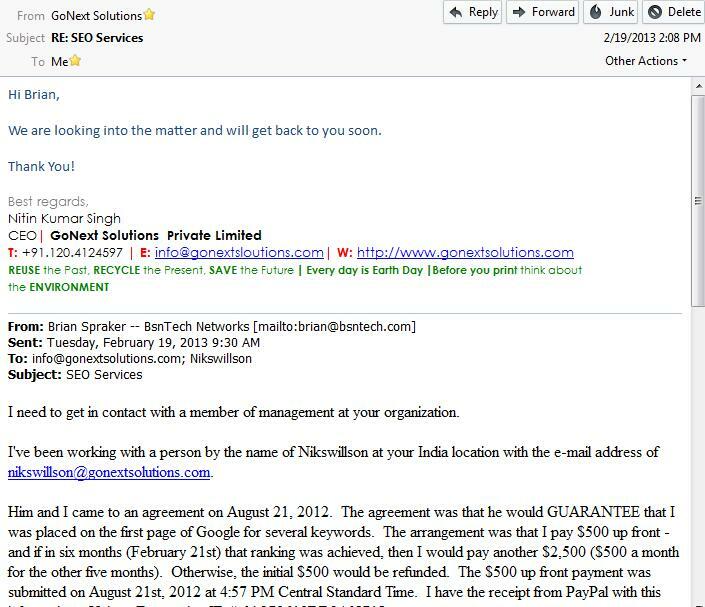 GoNext Solutions has spent a lot of time spamming the Internet and making fake names to post reviews about their company. If you are looking for a review of GoNext Solutions and the services they provide, look no further than my review below. Over six months ago (August of 2012), I got a message from an SEO company that was trying to pitch some sales to me for search engine optimization services. The company was GoNext Solutions out of New Delhi, India. Wow, a Senior Manager of Business Development? I couldn’t believe that I was talking to someone that seemed so high up in the chain – especially for a person that I figured would be doing more management work – instead of blasting the Internet with their business information. If you do a Google search for GoNext Solutions, you will find a lot of places turn up – even locations in the United States. But be forwarned that this company does not have any presence in the United States. There were a couple of pages that they put up showing they were in California. Not the case at all. So Nikswillson from GoNext Solutions and I started a dialog. He wanted to try and gather my business so I would use them as a freelancer/outsourcing provider for my customers SEO work. Well number one, I am an absolute firm believer that any business I do will stay in the United States. I will not outsource any of our work overseas – at all. But, they made me an offer – that I thought – I couldn’t refuse. I should have – of course – looking back six months ago. Nikswillson sent me a PowerPoint presentation as a sales pitch. I looked through it and was pretty impressed. They were showing that many large companies relied on them for SEO services. One of them was VistaPrint. After my GoNext Solutions review, I highly doubt they had any of those large-named companies and were infringing on their copyrights/trademarks by using their logos in their sales materials. I still have this PowerPoint presentation as well – in the event any of the companies would – on the off chance – ask me for it for proof of any legal action against GoNext Solutions. The agreement was – that I would pay them $500 up front for them to start doing some SEO work on my website. I gave them about 12 phrases that I wanted to be listed for. Out of all of them, I told them that I was already on the first page of Google for three of them. I provided Nikswillson the top three phrases that I must have on the front page of Google and he understood. GoNext Solutions then promised me that the work would be completed and needed six months. If GoNext Solutions and Nikswillson’s team was successful, then I would have to pay them the other five months ($500 a month – or $2,500 total) for the work that they did on getting my site to the first page of Google. Things started out good. Nikswillson responded to my e-mails in a timely fashion. Did you notice the above note where they are ASSURING me that they will rank my site on the 1st page of Google for the keywords within six months? OK, good, I’m glad I am not the only one. Well, let’s continue on. 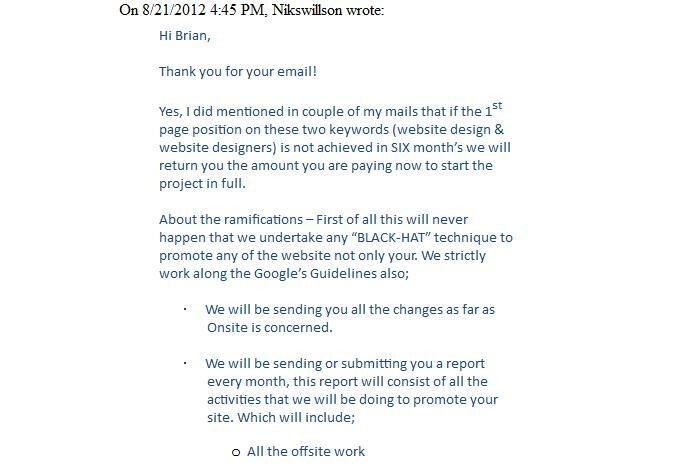 Here is some more proof from Nikswillson and his “team” at GoNext Solutions indicating that they would get these on the first page of Google – otherwise they would refund me the amount I paid up front. Did you see Nikswillson say “As promised we will bring the keywords on the 1st page in the stipulated time of SIX months, if not you won’t have to dispute anything on the PayPal we will simply refund the amount that was paid to us in the beginning.” Good, so I’m not imagining things. What was the rest of the e-mail about? Well, Nikswillson also promised me to send updated SEO reports every month so I could see how they were progressing. Well, not so much. 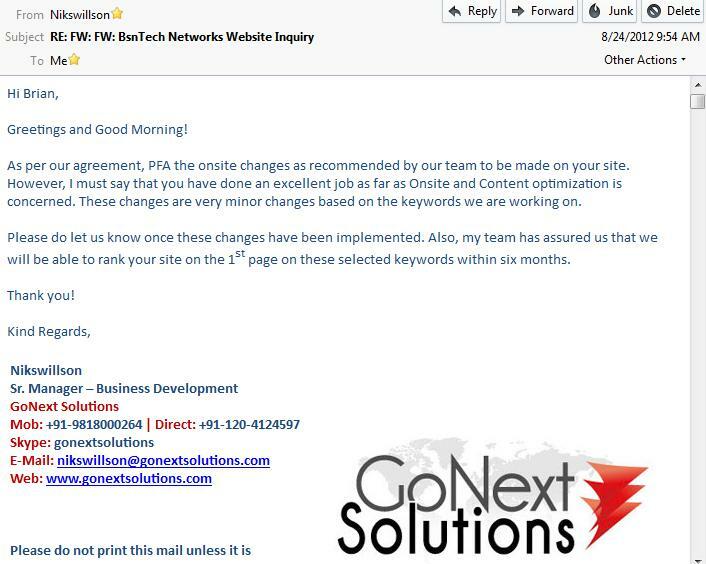 GoNext Solutions only gave me three reports over the six month period they were trying to do SEO work for my website. That clearly failed as well with only a 50% follow-through rate. I’m not sure what “every single pie as promised” is – as I didn’t pay in pies – I paid in US Dollars. But there again shows their logo, all of his contact informatoin, and the full e-mail promsing a refund. Well, February 2013 came around (as shown in the e-mail above) and I was no where listed in the top 200+ results for the keywords I told them to market me for. At this point, Nikswillson stopped replying to any and all messages that I had sent him. He knew that him and “his team” had absolutely and utterly failed at the task of doing any kind of SEO work on my site. Heck, over the six months, they actually made me lose some of my spots on the first page of Google for some keywords. So this review of GoNext Solutions is very harsh, but it should be known that Nikswillson and his team are not honest people. Nor is GoNext Solutions. How do I know the company isn’t? Well, let’s go to my next e-mail. As you can see, Nitin has just as nice of a signature as Nikswillson does. One thing I wanted to point out – their phone number that everyone has listed in their signatures. I tried calling this several times and was greeted by a recording saying that the number was invalid. Hmm – that is interesting – let’s advertise a phone number in our signatures that is invalid! Sounds just how GoNext Solutions operates! So Nitin Kumar Singh replied and said they would get back to me. Again, his response came in pretty quick – he replied the same day that the inquiry was sent in. I continued to pursue them by e-mails. I never did get any other reply back and they never did get back to me. So I called up PayPal and tried to file a dispute to get the $500 back that I sent to GoNext Solutions in good faith that the SEO work would have been completed satisfactorily. Unfortunately PayPal has a policy that dictates they are unable to place any disputes for anything over 45 days old. Well of course, since I paid them over six months ago, it was well outside of that period. PayPal did tell me that they would monitor their account for anyone else that called and complained about them or asking for refunds – and if there is any calls, they would potentially put a hold on their account and refund anyone that filed claims with them. So I struck out with PayPal. PayPal did, however, send a note to GoNext Solutions informing them that I had opened a dispute against them and the e-mail asked that they file the claim and resolve ethe dispute. Did I hear anything back from GoNext Solutions? Absolutely not. OK – now I was even more curious. Really? 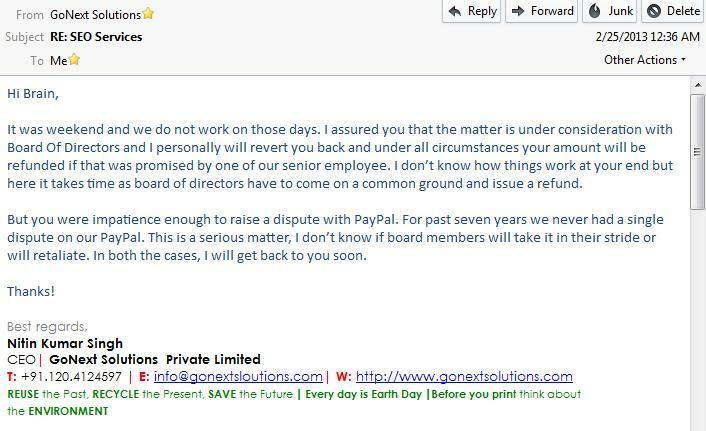 They have to consult their board of directors at GoNext Solutions to issue me a refund for $500? Holy crap – if GoNext Solution is as large of a company as they led me to believe, there should be abosolutely no reason to go to the board of directors to get approval to get my $500 back. My matter is “under consideration with the Board of Directors”. So funny to read. 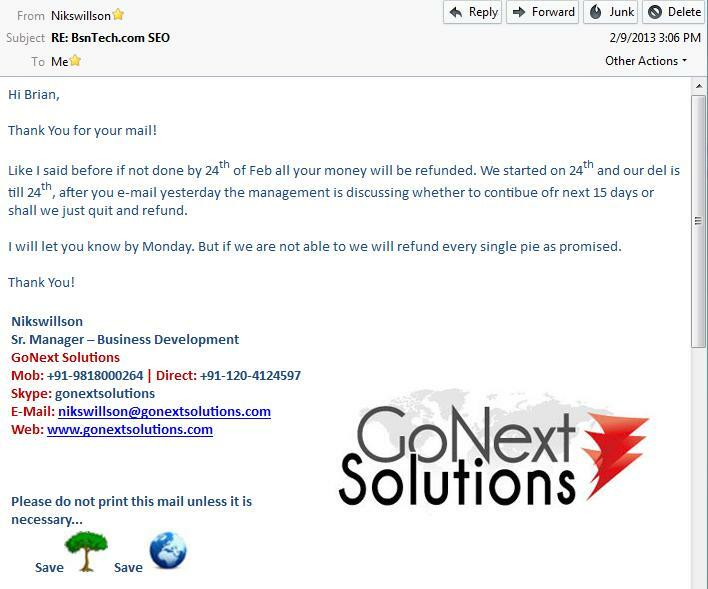 But when is even better – is – the CEO of GoNext Solutions – Nitin Kumar Singh – specifically said “and I personally will revert you back and under all circumstances your amount will be refunded if that was promised by one of our semior employee.“. Well, I absolutely provided enough proof above with all of those e-mails. Three e-mails promising me a refund if they failed. So Nitin went out on his own word that he would provide me the refund. Have I received my refund? Absolutely not. I’ve continued to e-mail them over and over again – and they are no longer replying to my messages. I’ve tried other e-mail services – such as Yahoo and Hotmail – thinking they blocked my e-mail account. But no reply to those either. If you are considering GoNext Solutions for any kind of services or work, I would highly discourage you from doing so. The service they provided was absolutely unsatisfactory. They didn’t provide reports in a timely manner and they horrendously failed at their task. On top of that, both a senior manager of the company – and the CEO – promised to provide me a refund. Both of them are not honest people – and simply will say anything to try and take your money and nor provide what they promised to do. So, take note of my GoNext Solutions review. There are many other GoNext Solutions reviews online and all of them are manufactured by Nikswillson or other members of the company – to try and sucker you in.